Cyst is defined as "a pathological cavity having fluid, semifluid, or gaseous contents and which is not created by the accumulation of pus." Kramer (1974). In this article, we present a case of epidermoid cyst of the retroauricular region and focus on the review of clinico-pathologic features and biologic behavior. 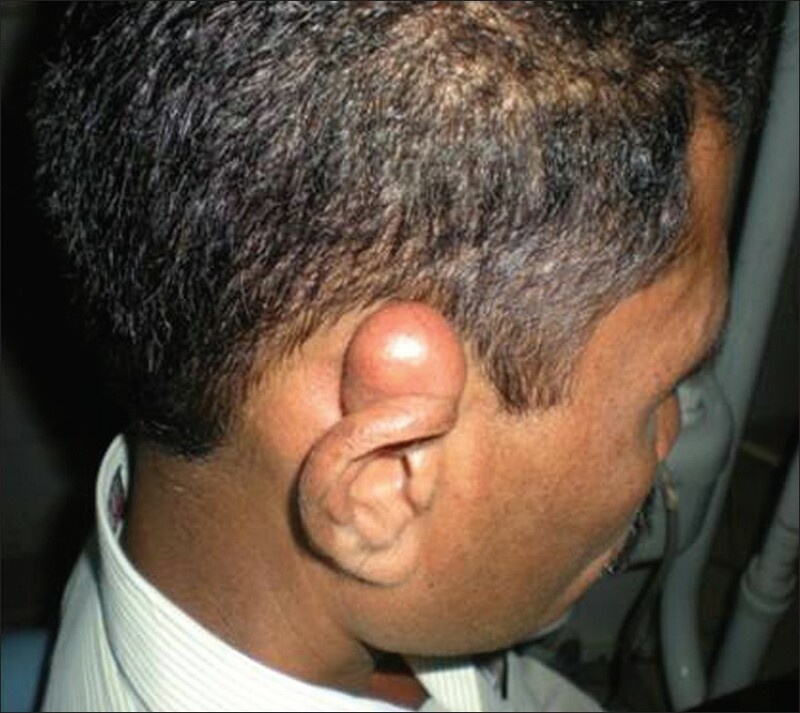 A 38-year-old male patient presented with a prominent swelling behind the right ear since the age of 10 years [Figure 1]. Swelling was initially of peanut size and increased gradually to present size of approximately 3 cm × 3 cm. The swelling was soft, cystic, globular, and non-tender with restricted motility. Margins were well defined. Skin over the swelling was normal and not attached to it. There was no discharging sinus or pointing abscess. Bruit or any pulsations were absent. There was no history trauma, fever, loss of appetite, discharging ear, difficulty in hearing, etc. The patient had no other complaints or other constitutional symptoms. There was no history of such lesions in his family members. A preliminary diagnosis of epidermoid cyst, dermoid cyst, or sebaceous cyst was proposed. Fine Needle Aspiration Cytology was done and revealed the presence of yellowish thick material, which was sent for cytological examination. Cytological examination revealed presence of desquamated epithelial cells and lots of keratin flecks [Figure 2]. The treatment consisted of total surgical removal of the lesion. The cyst was excised under general anesthesia. 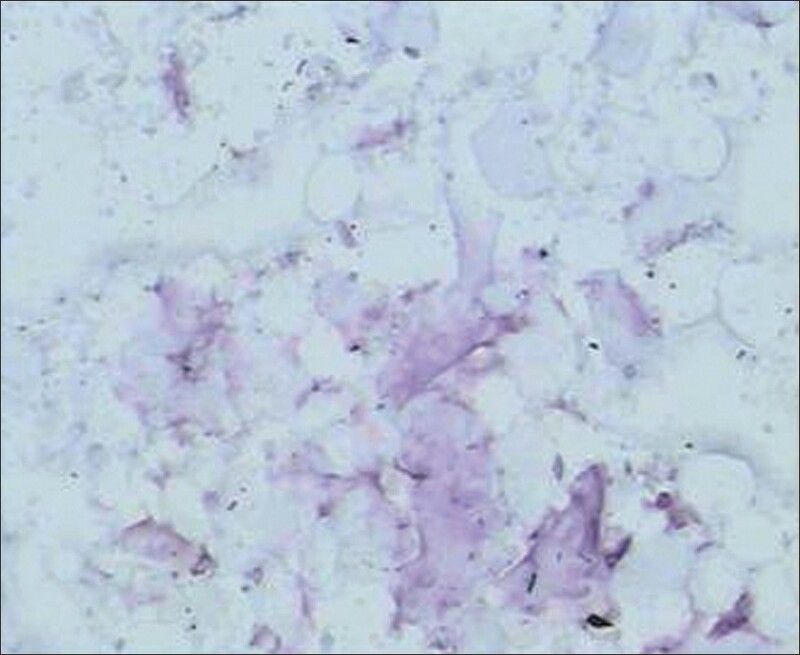 The macroscopic biopsy of the lesion consisted of soft round tissue of size 2 cm × 2.5 cm, grayish black in color, and cystic in consistency [Figure 3]. Histopathological examination confirmed the diagnosis of epidermoid cyst by presence of cystic lumen lined by stratified squamous epithelium with orthokeratin production. The lumen was filled with keratin [Figure 4]a and b. The connective tissue capsule consisted of fibrocellular stroma with numerous endothelial lined blood capillaries, which were engorged with RBCs. The patient was followed up during the next 6 months, and no recurrence of the lesion was observed. There is a slight male predilection, and the lesion occurs mostly in middle-aged patients, and our case report of a middle age male patient collaborates with what has been reported in the literature. The origin of epidermoid cyst is varied. They may form by the sequestration and implantation of epidermal rest during embryonal period, occlusion of the pilosebaceous unit, or iatrogenic or surgical implantation of epithelium into the jaw mesenchyme. Human papilloma virus infection and eccrine duct occlusion may be additional factors in the development of palmoplantar epidermoid cysts. Epidermoid cysts result from the proliferation of epidermal cells within a circumscribed space of the dermis. They have been shown to not be of sebaceous origin based on the analysis of their lipid pattern, which demonstrates similarities to the epidermis. In addition, epidermoid cysts express cytokeratin 1 and 10, which are constituents of the suprabasal layers of the epidermis. The source of epidermis is often the infundibulum of the hair follicle. Inflammation is in part mediated by the horny material contained in epidermoid cysts. Extracts of this material have been shown to be chemotactic for polymorphonucleocytes. 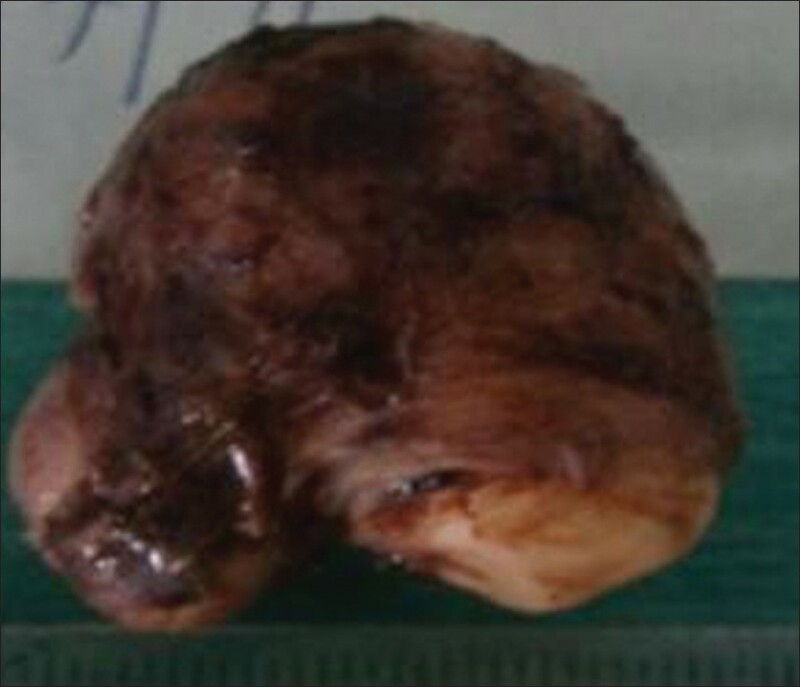 The present case underwent surgical removal of the lesion, and its success was confirmed by lack of postsurgical alterations and no recurrence of the lesion. 1. Shear M. Developmental cyst of head and neck region. Cyst of oral and maxillofacial region Shear. 4 th ed. Oxford: Blackwell Publication; 2007. p. 181-3. 2. Rajendran R. Developmental disturbances of oral and para oral Structures. Shafer's textbook of oral pathology. 6 th ed. Elsevier publication a division of Reed Elsevier India private limited Noida(UP); 2009 p. 67-9. 3. Neville. Developmental defects of the oral and maxillofacial region Oral & Maxillofacial Pathology, Neville BW oral and maxillofacial pathology 3 rd ed. Sunders Publication; Noida (UP) 2009. p. 32-3. 4. Corrêa MS, Fonoff Rde N, Ruschel HC, Parizotto SP, Corrêa FN. Lingual epidermoid cyst: case report in an infant. Pediatr Dent 2003;25:591-3. 5. Walstad WR, Solomon JM, Schow SR, Ochs MW. Midline cystic lesion of the floor of the mouth. J Oral Maxillofac Surg 1998;56:70-4. 6. Lazaridis E, Tepedino M. Epidermoid Cyst of the Outer Ear and Hearing Loss: Case Report. Int Arch Otorhinolaryngol 2007;11:494-7. 7. Samper A, Ruiz de Erenchun R, Yeste L, Bazan A. Dermoid cyst on the auriculotemporal area. Plast Reconstr Surg 2000;106:947-8. 8. Bauer DJ, Diwan R, Honig BK, Yokel B. Large asymptomatic mass on the ear: Dermoid cyst of the auricle. Arch Dermathol 1994;130:913-4, 916-7. 9. Chidzonga MM, Mahomva L, Marimo C. Gigantic tongue lipoma: a case report. Med Oral Patol Oral Cir Bucal 2006;11:E437-9. 10. Gómez Oliveira G, García-Rozado A, Luaces Rey R. Intraosseous mandibular hemangioma. A case report and review of the literature. Med Oral Patol Oral Cir Bucal 2008;13:E496-8. Siva Prasad Reddy, G., Sekhar Reddy, N.V.S., Reddy, G.V., Sriharsha, K.